INFPs are almost all naturally creative people. They have an imagination that is boundless and a gift with words and writing that has made them some of the most renowned authors of all time. Rumored INFP creatives include Vincent van Gogh, Albert Camus, Edgar Allan Poe, and Kurt Cobain. 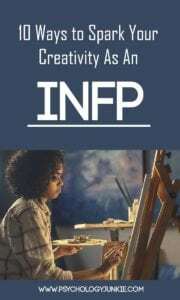 With their outside-the-box thinking, non-conformist mindset, and deep emotional world, INFPs are probably the last people who need MY advice on creativity. That’s why I went to as many INFPs as I could find to get THEIR tips on hacking a creative mindset when you are feeling blocked. Here are some of their best ideas! Did you know that when you spend time outside in a natural environment, how you view time transforms? A study done by Stanford University found that when people go outside they feel a sense of “awe”, as though time is expanding. Instead of feeling pressured, anxious, or rushed, they feel like time is in abundance. Creativity is often blocked when we feel pressured or constrained by time. Being in nature increases brain function, calms the soul, boosts your mood, and gives you the space to be creative. Cancel non-essential responsibilities and “schedule” some non-scheduled time. Don’t plan anything out, just leave that time open. Allow yourself to be bored. In a recent study, researchers asked a group of subjects to do something boring, like copying numbers out of a phone book, and then take tests of creative thinking, like devising uses for cups. Surprisingly, bored subjects came up with more ideas than non-bored subjects! Boredom sparks creativity because a restless mind is anxious for stimulation and must create out-of-the-box options! Listening to music, especially classical music, improves memory, cognition, and creative thinking! I spoke to dozens of INFPs who told me that when they are in a creative block, they turn on the tunes to get inspired and find creative strategies and ideas! I spoke to several INFPs who are herbalists and they mentioned the creativity-stimulating powers of essential oils. Apparently frankincense fuels creativity by reducing stress and anxiety, grapefruit makes you more alert, and eucalyptus revs up the mind and makes it more creatively powerful. You never know when an amazing, ingenious idea will strike you. Keep a journal or notebook handy so that you can catch it before it’s forgotten! Okay, I’m not suggesting that you get majorly depressed. But find something melancholy that stirs your passions! Many INFPs told me that when they are in a creative funk they find watching sad movies, listening to sad songs, or reading melancholy stories evokes their own emotions and stirs them to create some of their most passionate work. Extraverted intuition, the auxiliary function that INFPs use, is stimulated by new environments and experiences. Go somewhere you’ve never been and explore a landscape you’ve never seen! Several INFPs I spoke with said that traveling and having a nomadic lifestyle keeps them creative. One study I heard recently found that placing constraints on creativity actually led to more creative expression! Try building a LEGO sculpture out of only one shape of block, or try coloring a bouquet of flowers with only one dull, unsharpened crayon. Think of a way you can problem-solve a creative piece of art! One INFP artist I spoke with said that when she’s creatively stifled she paints without expectation and without a plan. She just lets the brush guide her and doesn’t worry about creating anything legible. She follows her intuition and emotions and sees where that takes her! Do you have any suggestions to add? Let other INFPs know in the comments! #6 is crucial for collecting ideas, if your mind is full of holes like mine. Also for exploring ideas to see what emerges. #9 is amazing. I find I do so much more with constraints than just a blank page! Some magical poems have grown from simple writing exercises like a list of 5 (or 12, or 26…) unrelated words. A great kitchen plan grows from knowing how you work and where the plumbing and windows are. Hello, Mrs. Storm, thank you so much for this article! I believe I am an INFP and I often get stuck when it comes to creativity and inspiration. This article is really helpful, and I agree with most of the things you listed, especially reading, listening to music, and getting emotionally motivated for inspiration. I’ve read most of your articles and I love your blog!